Recent contest had shown the winner of Rokiahi V3 design in Deviantart! because of that, now i mainly focus on making this character. This is likely to say, my next project would be modeling Rokiahi v3 model! 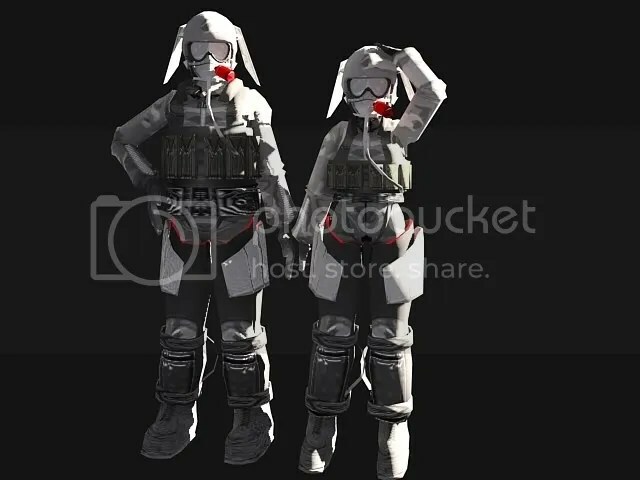 but recently someone just donate me some money, so i do a favor to making what he wanted to… so the course work have change a little… i must model Kagamine Rin and Len in Panzer Armored Infantry Costume (mecha musume) first… anyway thanks for the donation! Sorry to bump this January news but I am coming across an issue with the SpecRifleman (the male model). After I killed the male rifleman and walked (or crouched) over his dead body, I am instantly gibbed!